Beauty Bungalow Microcurrent: Fitness for your face, no gym required. Gentle currents stimulate facial muscles and energize cells for visibly sculpted skin. Microcurrent: Fitness for your face, no gym required. Hello, St. Pete… the skincare game changer is here! Gentle, low-level electrical currents recharge skin to produce ATP energy in each cell. 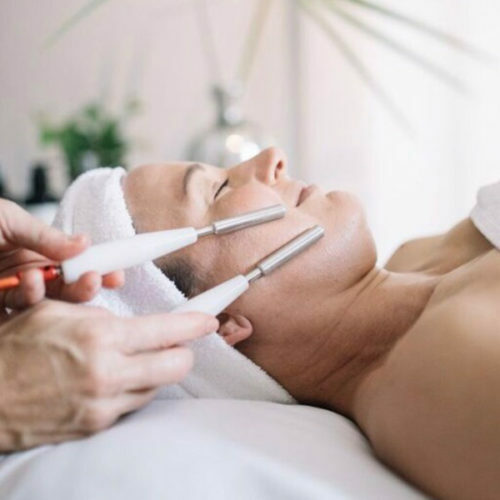 Pain-free with no downtime, these currents mirror your body’s own natural electrical impulses, therefore, reviving and reeducating the muscles of your face to look visibly lifted and energized. You feel alive, she says of microcurrent’s effect. There’s a brightness. The energy flow in your face—it’s better than caffeine. You look rested. Her holistic approach takes some of the weight off the loom of the future, too. There’s no such thing as anti-aging—you can’t stop it, so let’s just do it as gracefully as possible. Microcurrent improves your skin by promoting good circulation, oxygenating cells and detoxing waste in the same way exercise brings a youthful rosy flush. Microcurrent depuffs skin and drains excess fluid. Microcurrent energizes skin cells by producing ATP. Microcurrent visibly lifts and contours muscles of the face.